Rappolt, Mark. "How does Jeff Koons do it to me?" Art Review September 2009, p. 97, illustrated in color. Coome, Martin. "On The Surface." The Big Issue [London] 13 July 2009, illustrated in color. West, Naomi, ed. "Bazaar Talking Points: The Summer Hotlist." Harper's Bazaar July 2009 [UK edition], p. 56, illustrated in color. Lewis, Ben. "Popeye the Eye-Popper." Evening Standard [London] 2 July 2009, p. 35, illustrated in color. Glover, Michael. "King of comic relief." The Independent [London] 1 July 2009, pp. 14-15, illustrated in color. Campbell-Johnson, Rachel. "How Do You Like Your Lobster?" The London Times 1 July 2009, pp. 14-15, illustrated in color. Holzwarth, Hans Werner, ed. Jeff Koons. Cologne, 2007, pp. 530-531, illustrated in color. Yablonsky, Linda. “In the Studio: Jeff Koons.” Art + Auction March 2004, p. 38. Woltmann, Marit, ed. 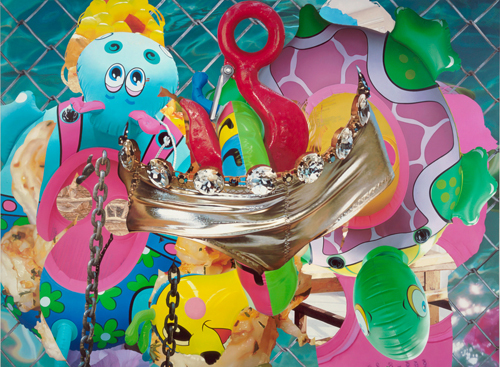 Jeff Koons Retrospektiv. Exh cat., Oslo: Astrup Fearnley Museet for Moderne Kunst, 2004, p. 123.